I mentioned briefly in my previous post – Baby-Led Weaning: First Foods & Favourites – some of Caterpillar’s favourite shop-bought snacks, especially when he was first weaned, but today I’ll be reviewing some in more detail from the Organix Goodies range. Organix is one of the leading brands for young children and when I needed quick, on-the-go snacks during Caterpillar’s early weaning days they were often the brand I first reached for. In an ideal world, we’d only give our children homemade treats and snacks but I’d be shocked if there is any mum out there who manages this every single time. So these products, designed specifically for babies and toddlers, and developed under Organix No Junk promise, are a nice compromise when you simply don’t have time to spend in the kitchen. Caterpillar has always loved his food, but it’s only in the last six months really that his near-constant demand for snacks has gotten a little out of control. From speaking to other mums of three year olds I don’t think I’m alone, thankfully. With Caterpillar, it is all the time. I don’t know if he is genuinely hungry, bored or just addicted to sugar and salt but my kitchen, purse and patience can hardly keep up. I try to stick to fruit and raw carrot and cucumber sticks when I can but I do allow him small chocolate bars and crisps too now he is that little bit older. I definitely feel guilty though. Childhood obesity is everywhere in the media these days and, being a little overweight myself, the fear that I’m overfeeding my son or giving him too much sugar and junk is often on my mind. Organix offer a nice middle ground for when he refuses fruit and veg but I don’t want to give him any chocolate or sweets. 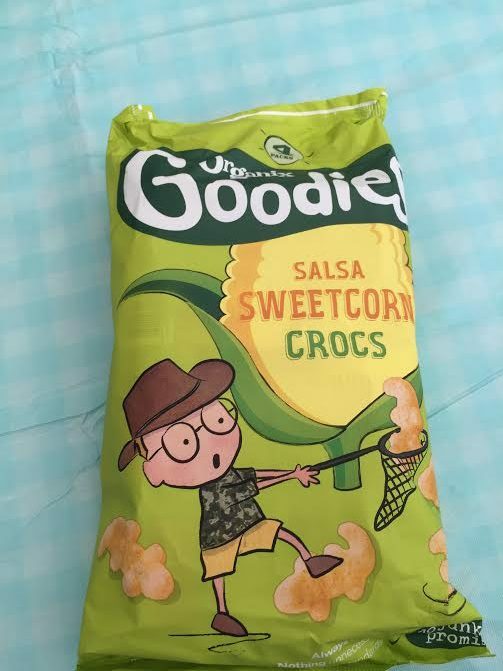 Alternatives to crisps, these are usually corn or rice based and we tried the Sweetcorn Salsa Crocs. Bright packaging and the crocodile shape makes them really appealing to kids and the natural ingredients and almost zero salt appeals to parents too. They are good size packs for throwing in your bag and you can really taste the sweetcorn which is great. These were probably my favourite product when Caterpillar was first weaning. Back then one biscuit could keep him occupied for ten minutes which was really handy. 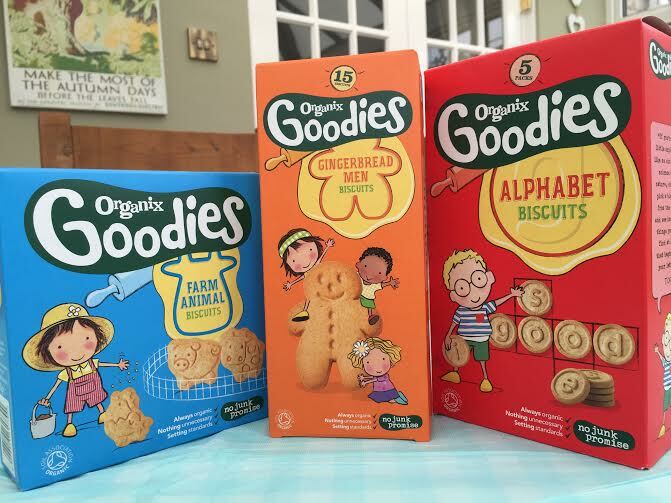 We reviewed three types; Mini Gingerbread Men, Farm Animal Biscuits & Alphabet Biscuits. The first two come in one big packet so are most useful to keep in your cupboard at home (although I do take the gingerbread men out just in a plastic container sometimes), whereas the Alphabet Biscuits come in individual packets so are great on-the-go, I love the educational element of these too. Mine and Caterpillar’s personal favourite are the gingerbread men as you can really taste the ginger. Again, no sugar or artificial flavours and the natural sweetness actually comes from grape juice. 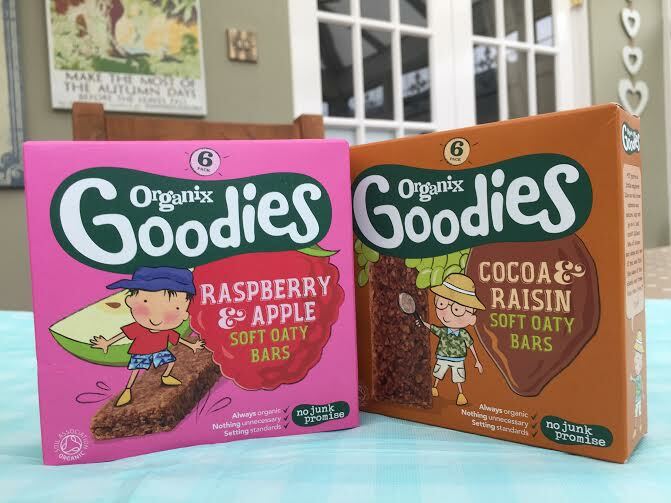 These come in a large range of different flavours and we reviewed the Cocoa & Raisin and Raspberry & Apple Oaty Bars, plus the Apple & Orange Soft Oaty Bites. They have a flapjack style consistency and are really moist. The size of the bars may be a little big for younger toddlers to eat in one go but Caterpillar demolishes them – the cocoa ones are his favourite. 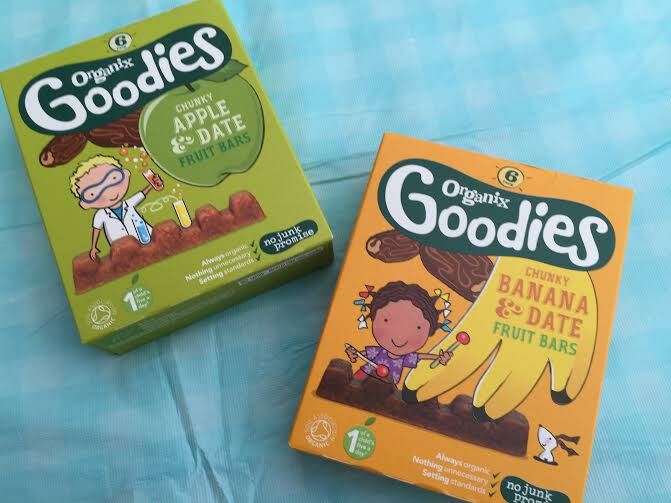 The Oaty Bites are good for slightly younger children though, or when you only want your toddler to have something really small, as they are bite-sized and individually wrapped so very handy. I think these may be relatively new as I don’t remember seeing them during Caterpillar’s early weaning days. They remind me of the fruit flakes you get from other brands but in a more solid bar; a really great, healthy alternative to gummy sweets made from natural fruit syrups. In truth, Caterpillar isn’t keen on these ones but I think that’s just because he is slightly older and has had more than his share of real sweets now so wont be fobbed off with anything less! However, as a younger tot I think he would have been much more keen as he used to love the fruit flakes. And, oddly, my husband tried one too and really enjoyed it! The Organix Goodies range are brand leaders for a reason, in my opinion. They have a really wide variety of products and are appealing to both adults and children. 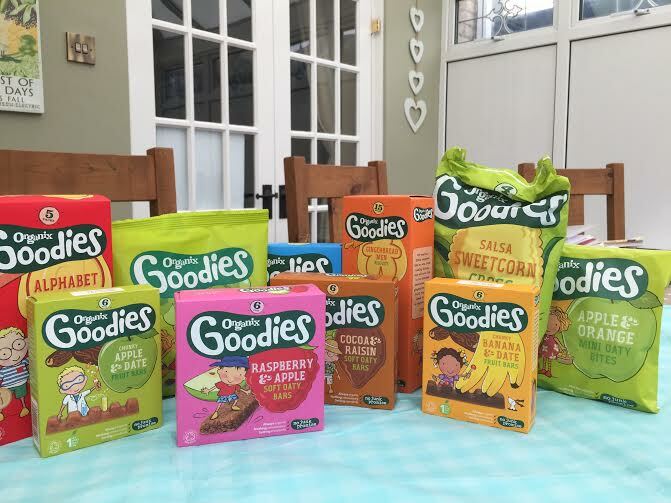 If you also have a small person trailing you around the house demanding food then this giveaway might come in handy too; Organix have kindly donated a Goodies snack bundle worth £20. For your chance to win it, simply enter below. Disclosure: I was sent a box of Organix Goodies products in exchange for an honest review. All words & opinions are my own. Organix have a lovely variety don’t they. And it’s nice to know there is healthier snacking options out there. Many thanks for running this lovely giveaway. Organix is a great brand offering healthy alternative snacks. Thanks for the competition – great prize. My son loves Organix and so do I.
Laura @dearbearandbeany recently posted…Review: Mindfun Tee…Plus a Fab Giveaway! We always loved Organix when our children were tots – they were so handy to have in our bags. My granddaughter is currently mid way through weaning and loves these snacks. Thanks for the giveaway. We love Organix here. Perfect snacks!